I have a managed metadata column named TELL Category. My understanding is all columns have a crawled property and if the column is a managed metadata column it is automatically mapped to a managed property when it is crawled. In the image below, it appears that a managed property was created. I can't seem to surface it in a custom display template. 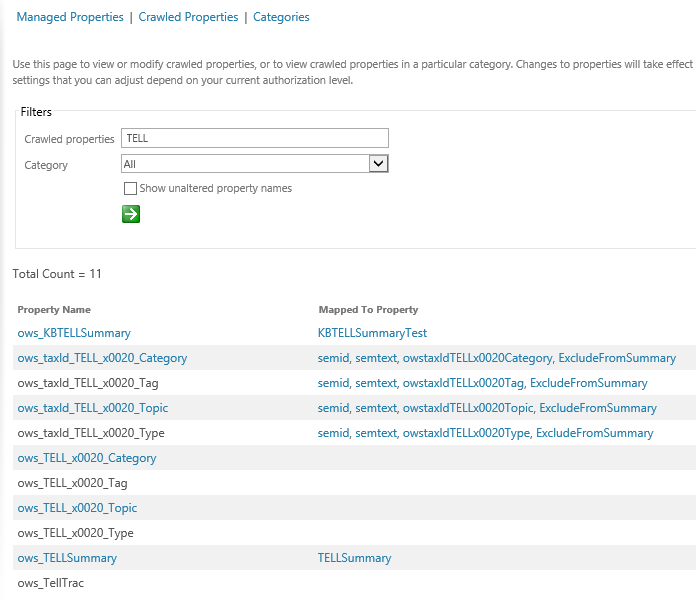 Additionally, TELL Category is listed twice in the list of crawled properties. Any idea why this is the case? How should I approach this? It's not clear to me what the additional mappings are... What is ExcludeFromSummary? Not the answer you're looking for? Browse other questions tagged search managed-property crawled-property or ask your own question.